All of my boys had bad diaper rashes at one time or another while they were babies. It is one of the most excruciatingly painful things that happens so quickly. Change of diet, teething, medicine, illness and allergies are just a few of the reasons many babies get diaper rashes. 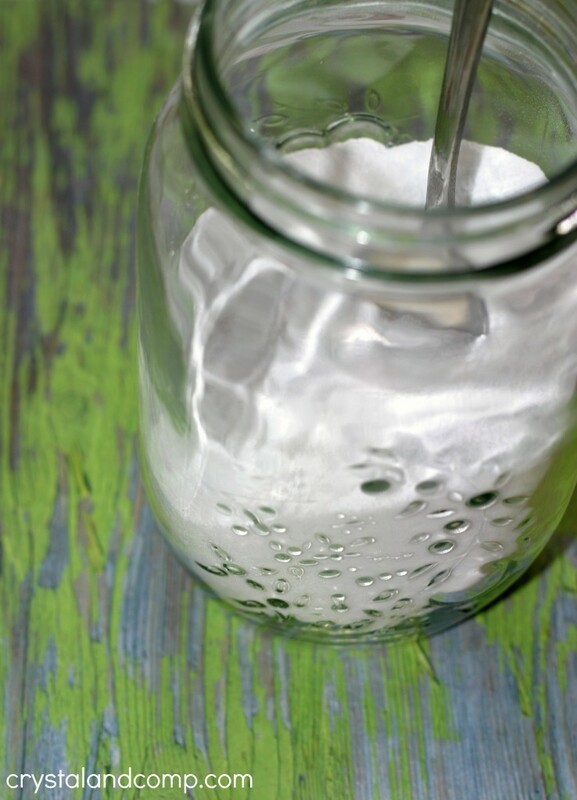 Here is a recipe for a diaper rash home remedy. 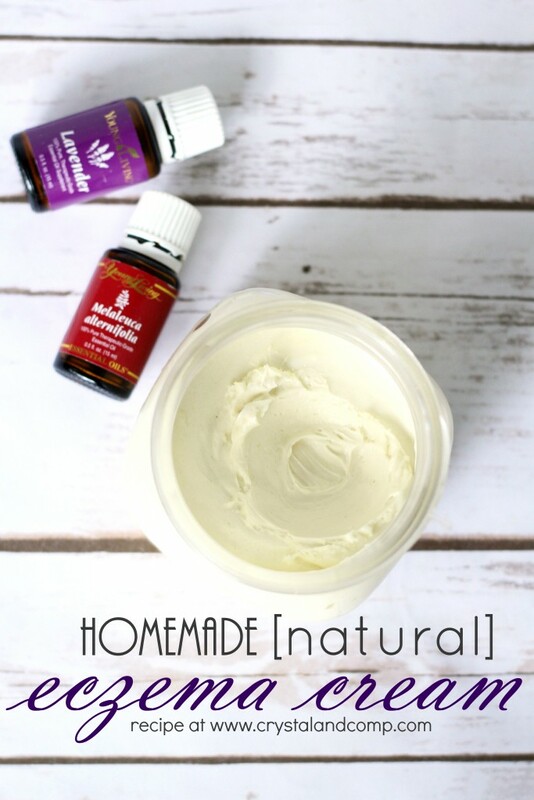 While all of my babies are out of diapers, I made some of this up and gave it to a friend to use on her little one who gets bad diaper rashes from time to time. It worked. Within one diaper change. Redness, pain and inflammation gone. And, it is made of natural things from the earth. This is super easy to make and uses just two ingredients. Takes all of two minutes to make. 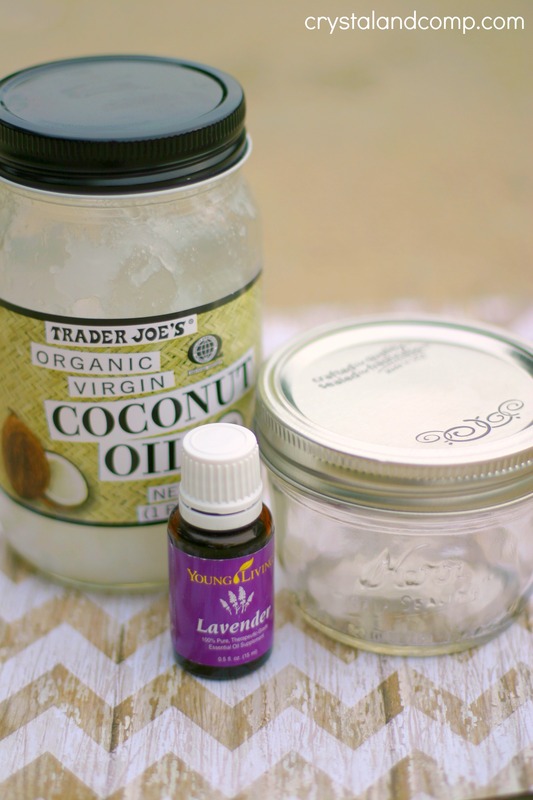 Gather up the coconut oil and Lavender oil. 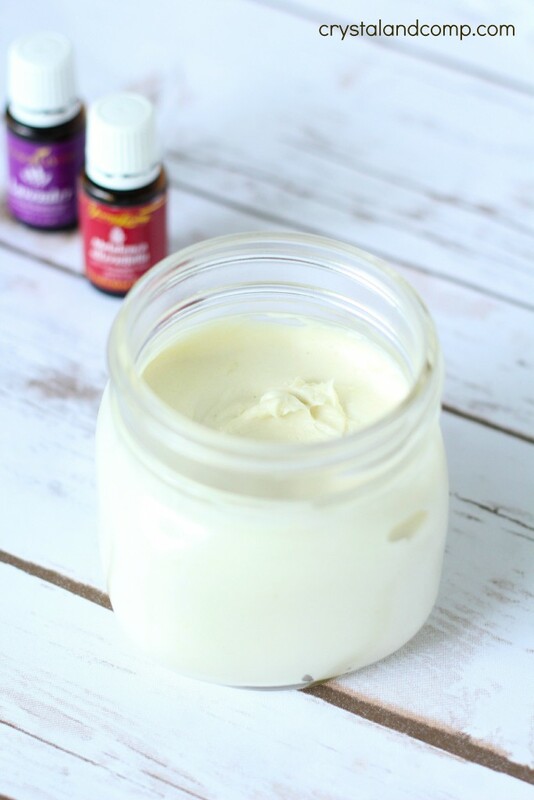 You will also want a measuring cup and spoon or spatula for stirring as well as a glass container to store diaper rash cream in. 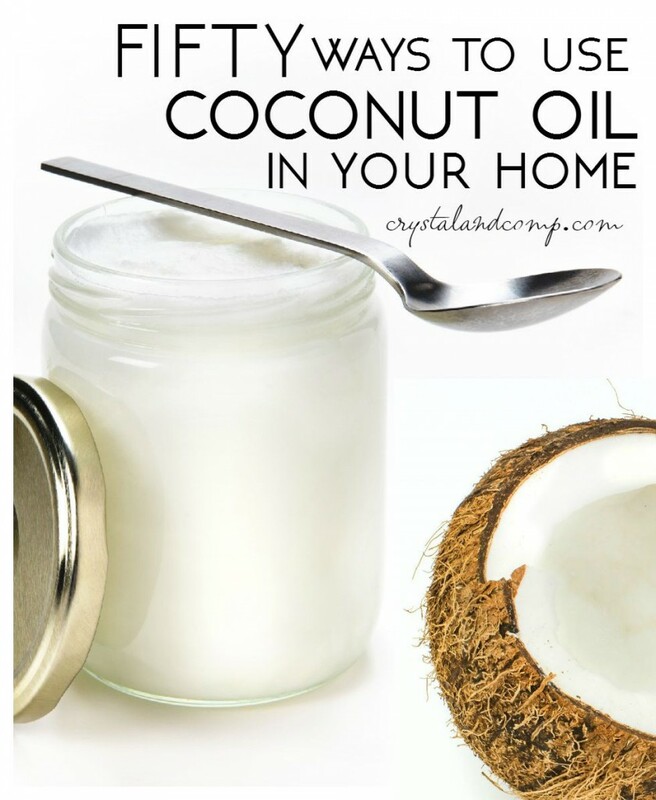 Measure out the coconut oil. 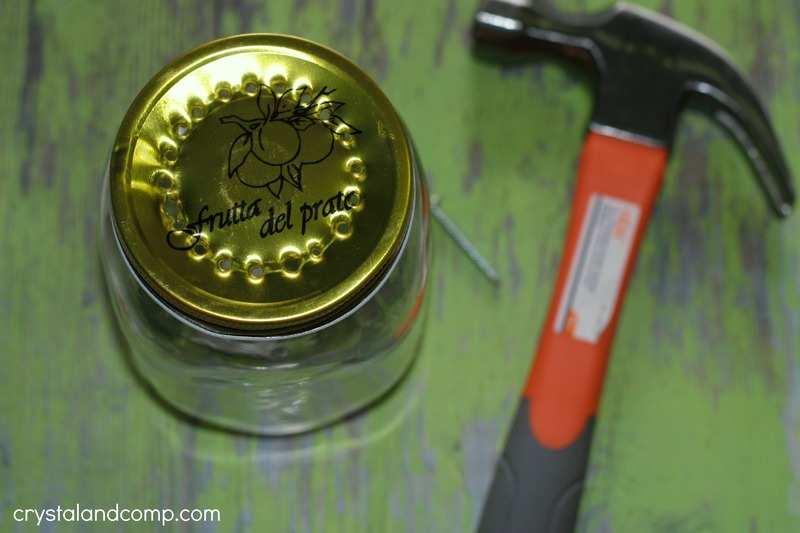 Pour it into a small, clean jar with a tight lid. I used these 4 oz Kerr jars. This diaper rash home remedy is perfect for your own child or to give as a shower gift. Lavender is soothing and healing and has natural anti-inflammatory properties. And, did you know coconut oil contains lauric acid (a property also found in a mother’s breast milk) and has antimicrobial and anti-fungal properties. 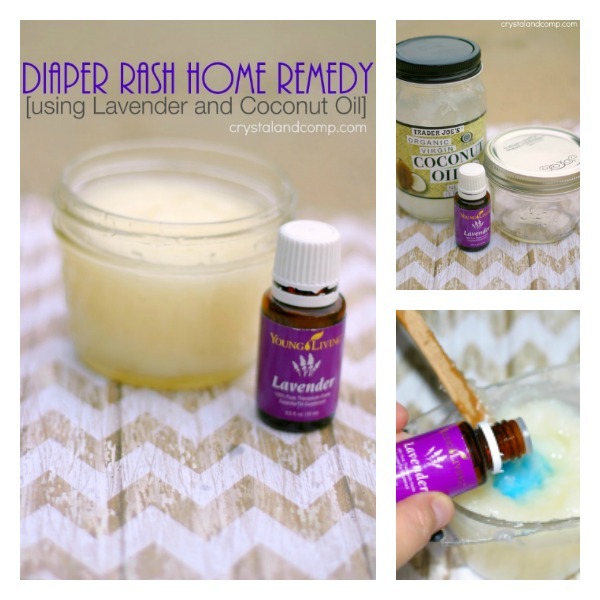 Have you ever used lavender oil or coconut oil on diaper rash? 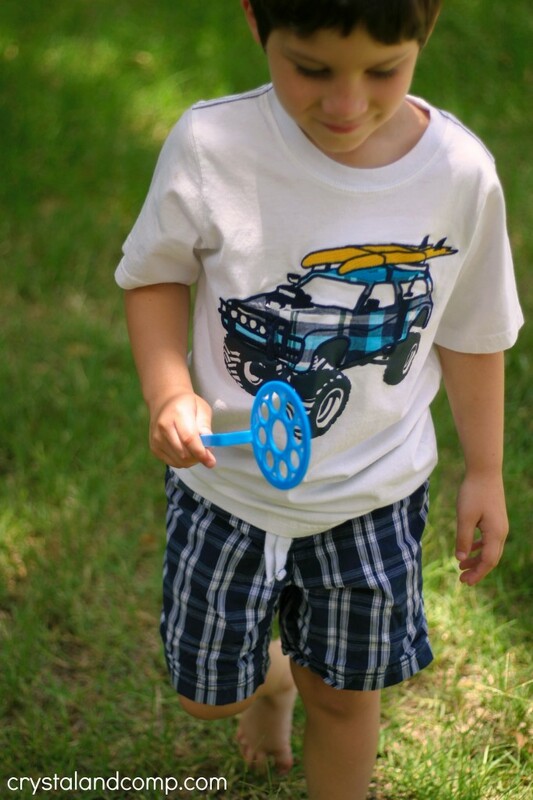 Summer is in full swing and I am on the hunt for fun activities for kids that involve a little outside play time. 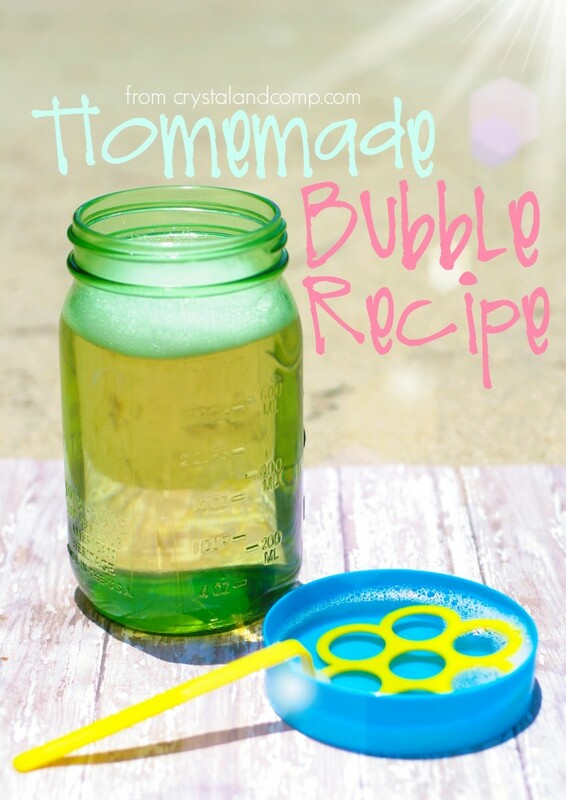 I have been wanting to make a homemade bubble recipe for a while. My boys LOVE to play with bubbles! What about your kiddos? 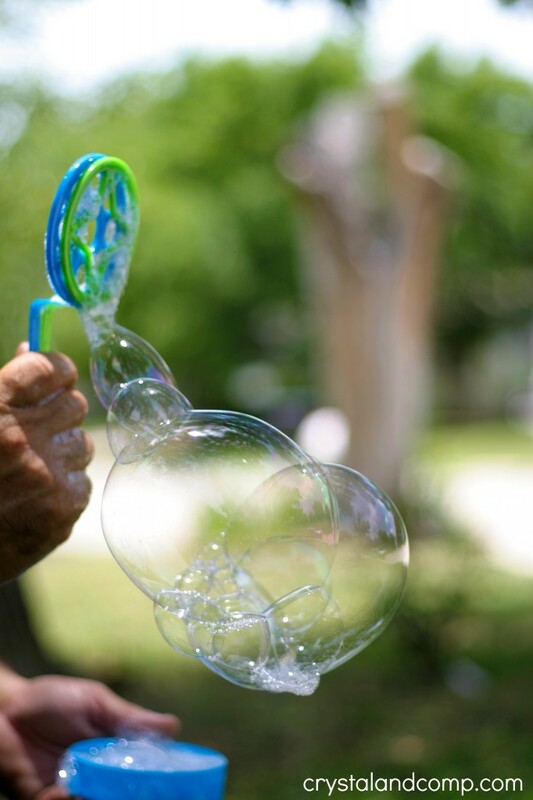 This morning we made these bubbles really quickly and easily. I bet you’ve got the items on hand to make them. This version makes a little over 4 cups of bubble solution. By noon it was too hot to play outside much, but this will be a perfect morning or late evening family activity. Ready for the simple recipe? 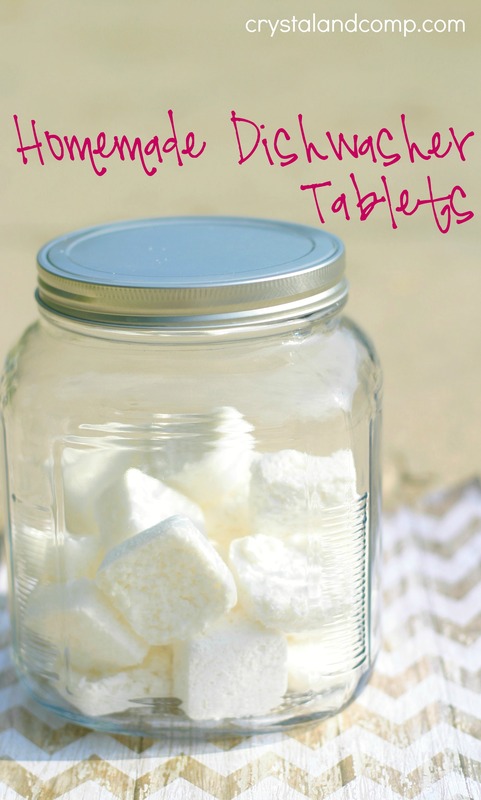 You will also want a large jar and spoon for mixing as well as bubble wands. 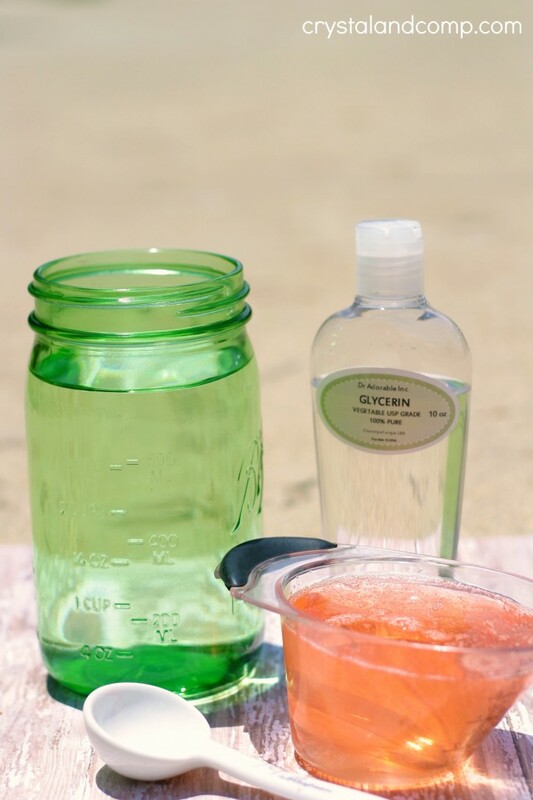 Add the hot water to a large jar that you can mix the bubbles up in. Add the glycerin and the soap. 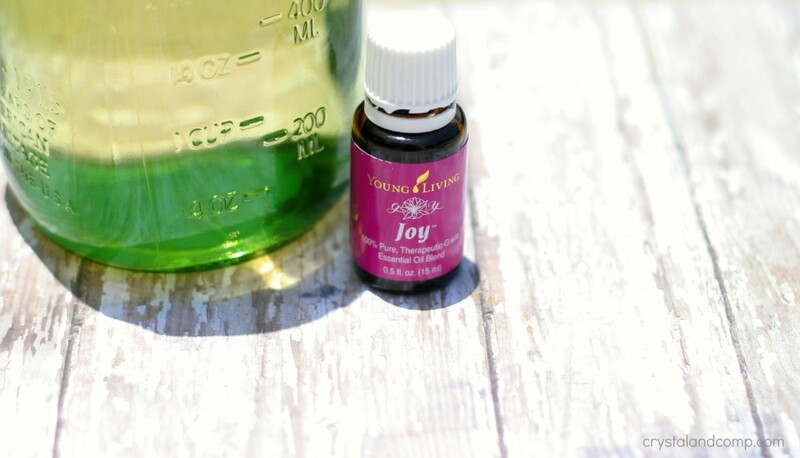 Add a couple of drops of Joy essential oil, this is totally optional, but it certainly makes for a happy smell! Here is where I buy essential oils online. Use a spoon to gently stir. Minimize making lots of foam at the top. 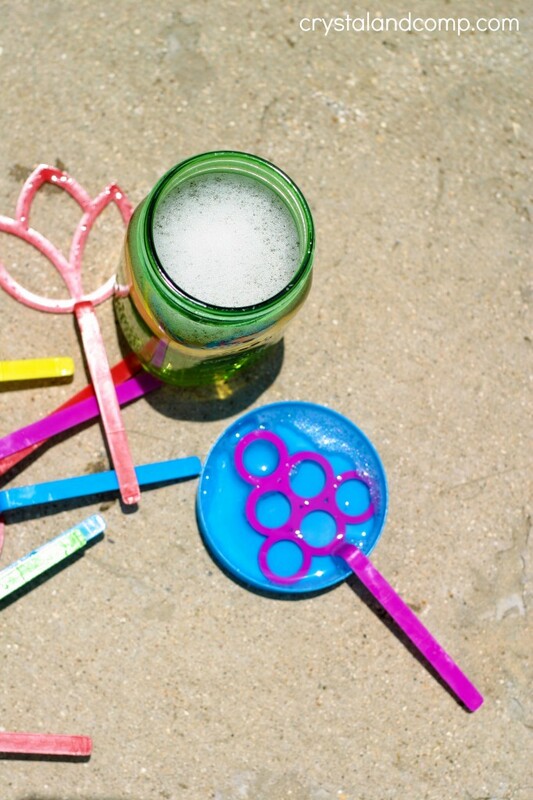 Grab your bubble wands and you’re ready to go. I found a packet of 12 online for a pretty reasonable price and free shipping. The kids had lots of fun until they got too hot. 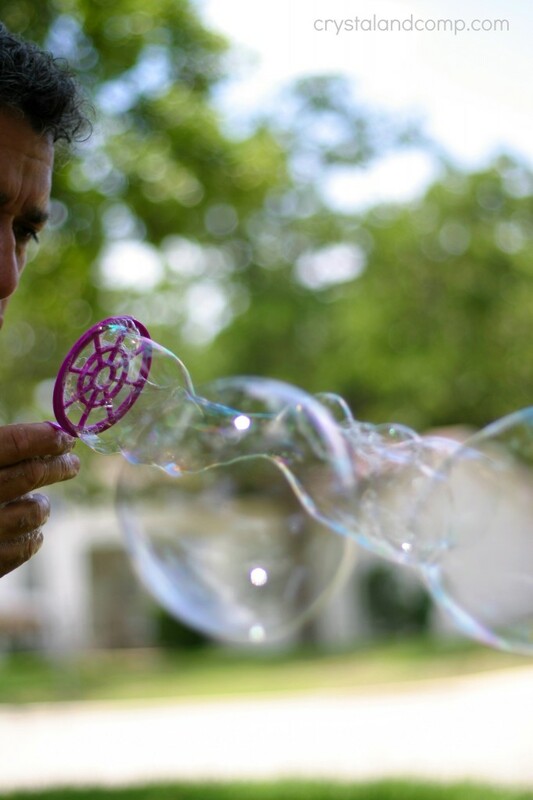 There are so many fun things you can do while making bubbles. 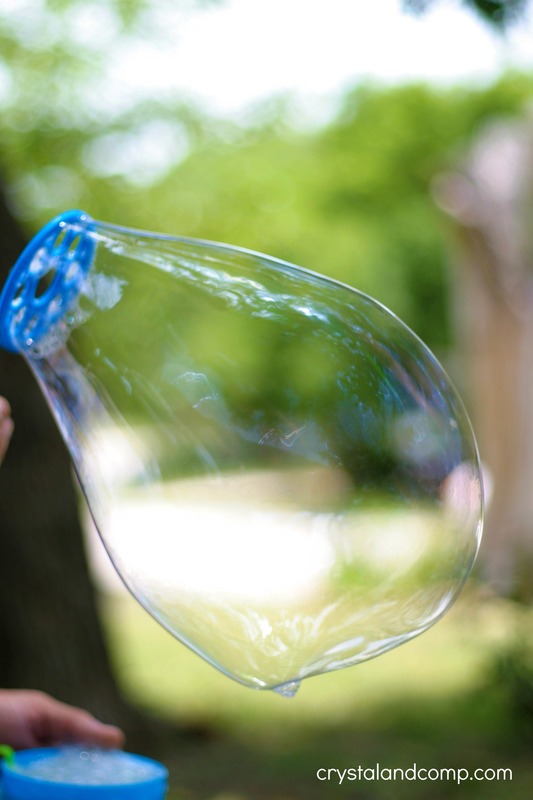 See who can make the biggest bubble! My husband and I had even more fun than the kids. 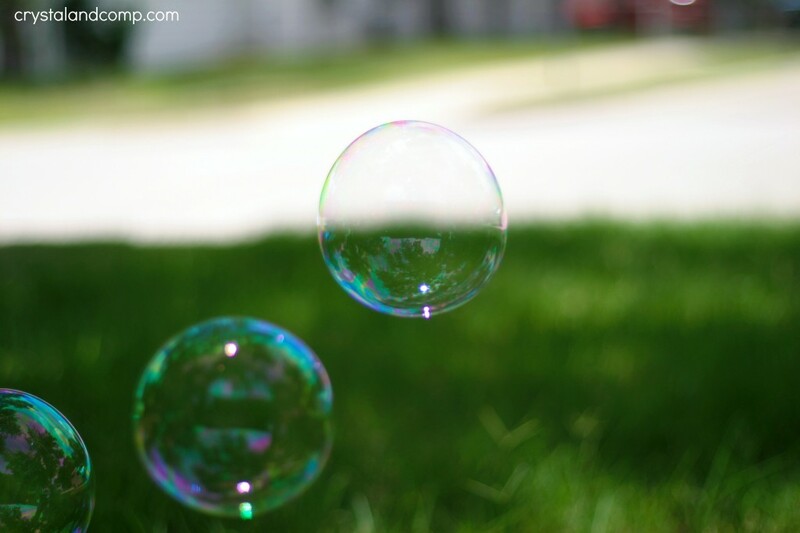 He was home for lunch and we made bubbles in the front yard. 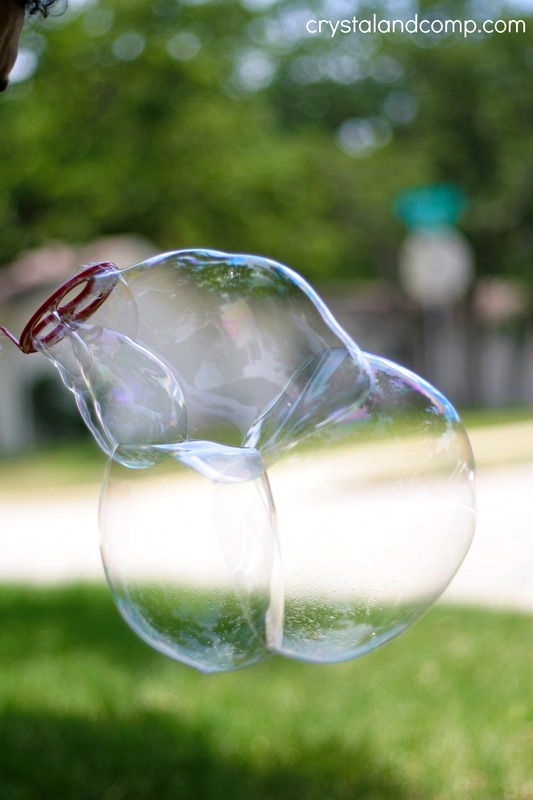 Any idea how hard it is to get good pictures of bubbles? They are translucent do they are hard for the camera to focus on. Not to mention the wind blows them away fast. 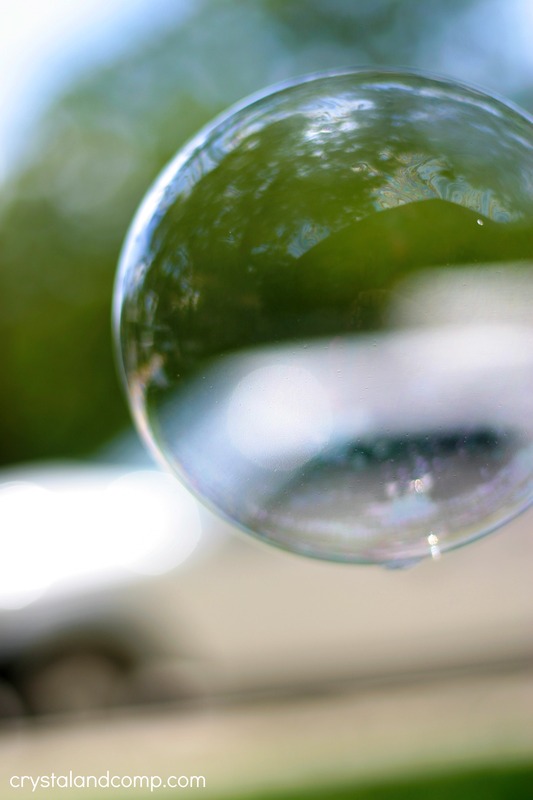 The glycerin in the recipe will help make the bubbles thicker. This will prevent them from popping so quickly. See all of the things you can create using different shaped wands. 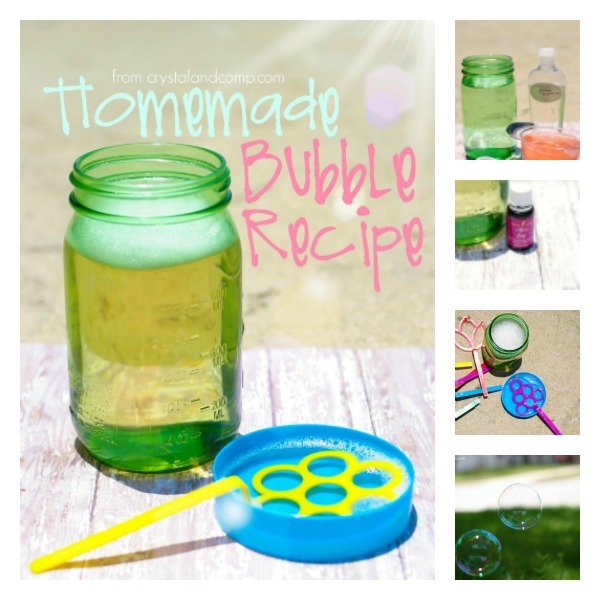 Who can create the most bubbles at one time? Such a fun activity to do as a family. 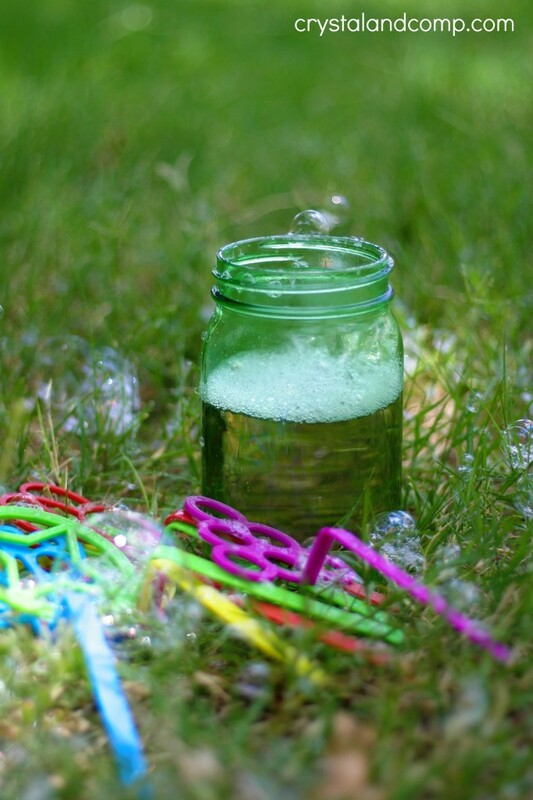 When was the last time you played with bubbles? 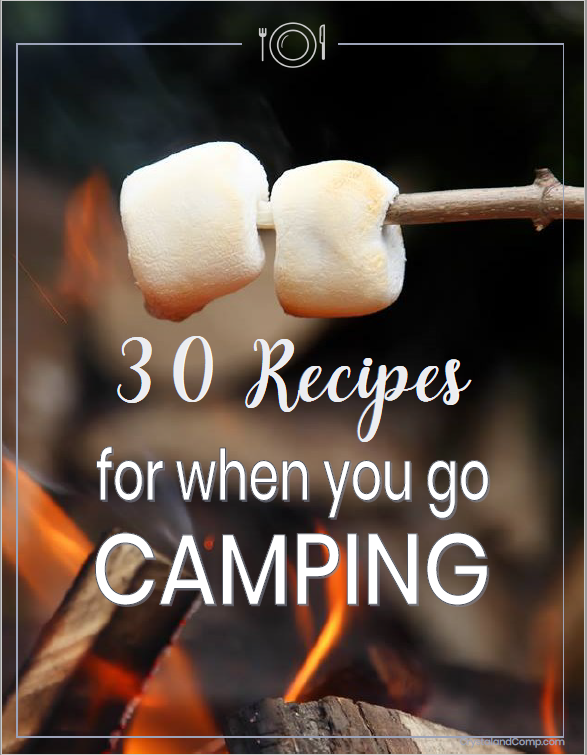 Have you ever considered making them homemade? It really is super easy! 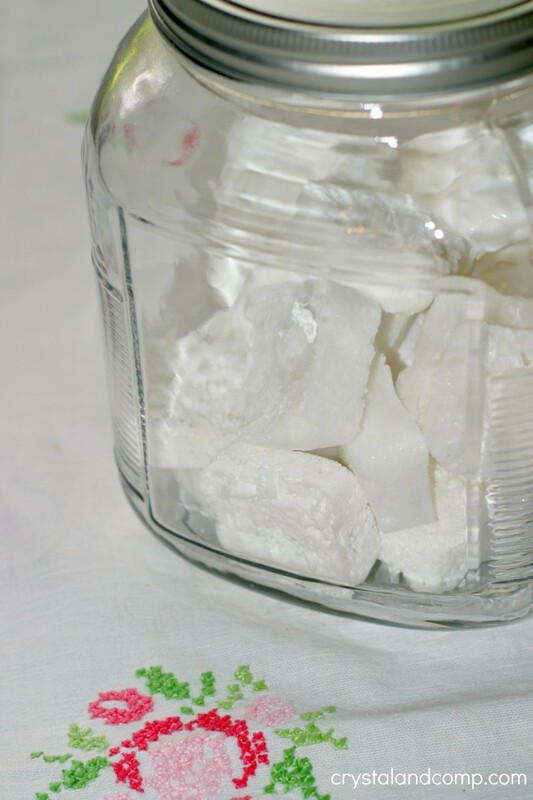 Back in March I made a homemade dishwasher soap recipe. It is what I’ve used to clean my dishes since. It’s lasting forever- we’re still using the same batch. The longer I used it the more I thought about how great it would be to turn it into tablets. I knew it had to be simple. Take the clean silicone mold and add 1 TBS of homemade dishwasher soap to each mold. Fill each mold square one by one. No worries if there are some lumps, I will show you how we will get rid of those in a minute. Grab your water, tablespoon and the essential oil. 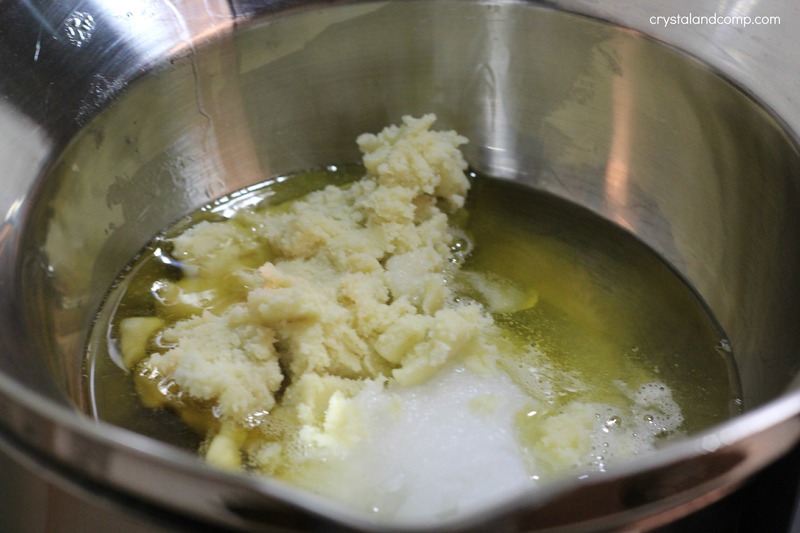 Put one drop of Purification oil in each square over the detergent mixture. 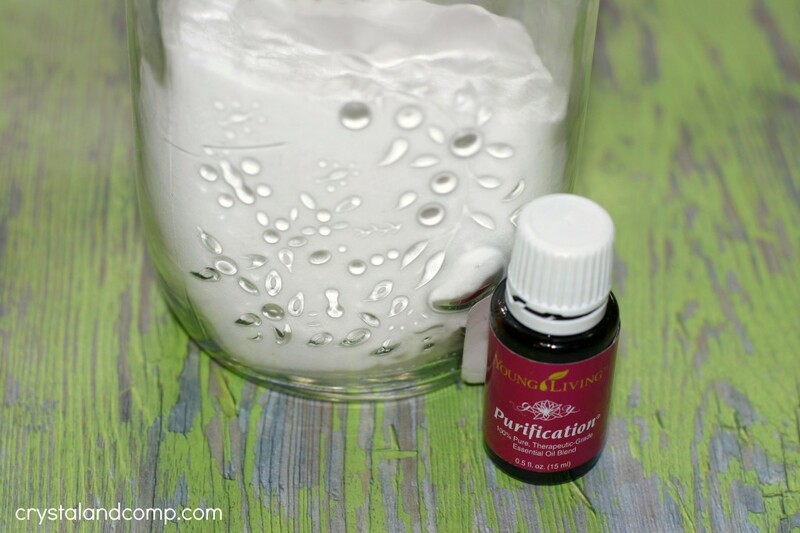 Purification has amazing purifying properties and it smells awesome! 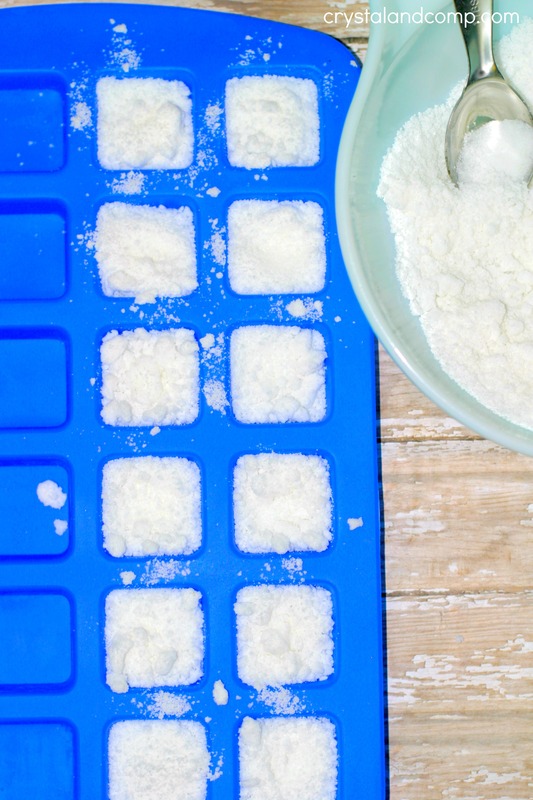 Use the spoon and add water to each square. ONLY ADD like 1/4th of a TBS of water at a time. A little water will go a long way. It may not look like it, but it will. 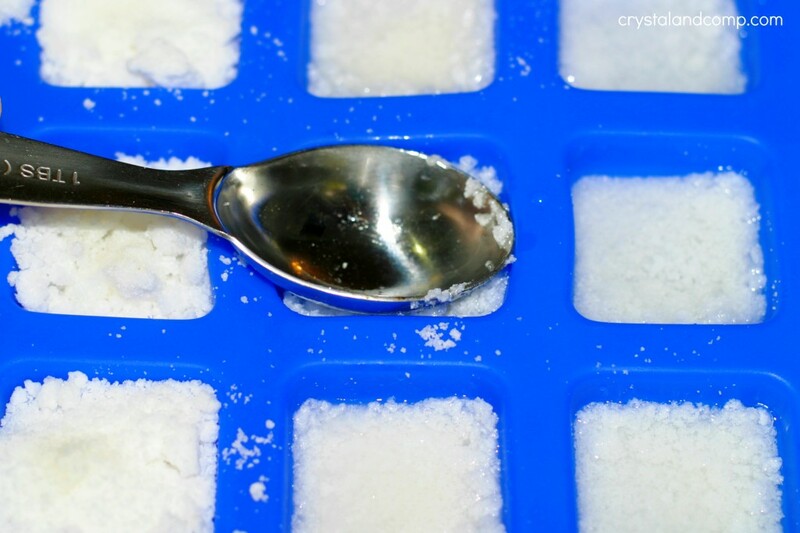 Use the spoon to kind of chop the detergent up and work it into the water. It will all mix together. Add a drop or so of water if you need to. 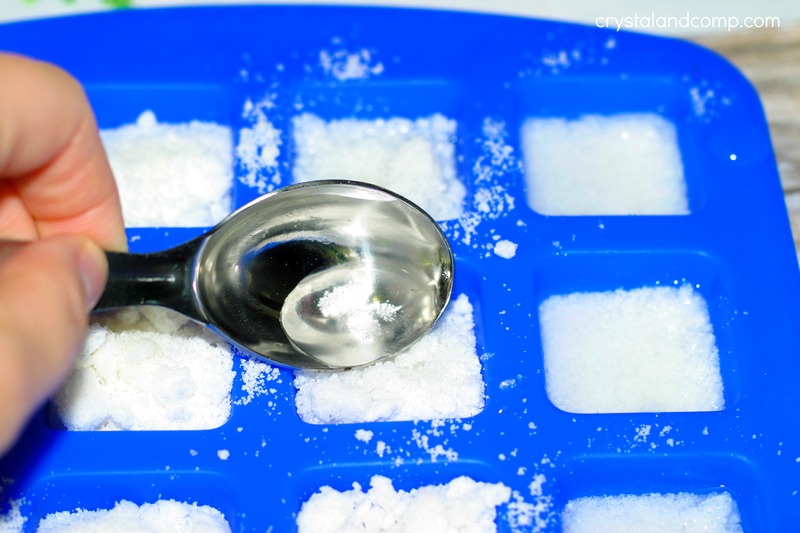 Once it is all well combine use the back of the spoon to press the detergent tightly into the mold. Let it sit for 24-48 hours on the counter to dry 100%. Once the tablets are dry they will pop right out of the mold and there will be no water residue left behind in the mold. They pop out super easy. Put the in a container and store them on your counter. 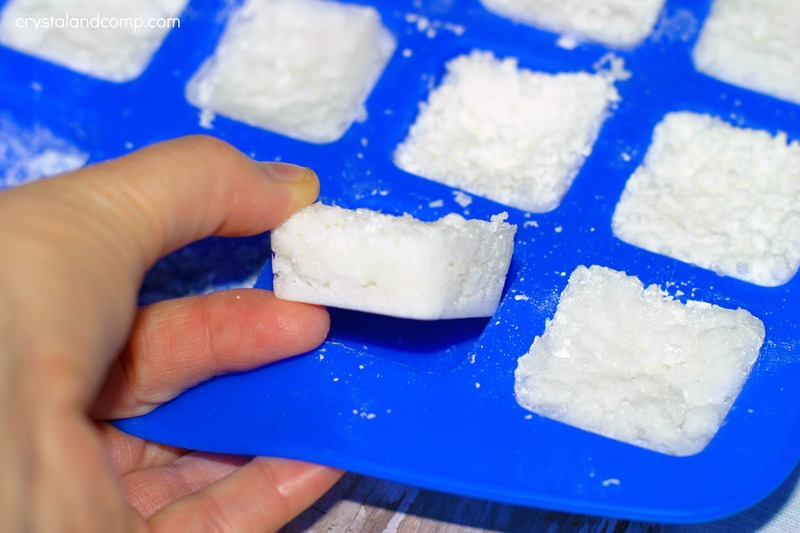 I love it better than scooping it out and it keeps the detergent from clumping and sticking together. 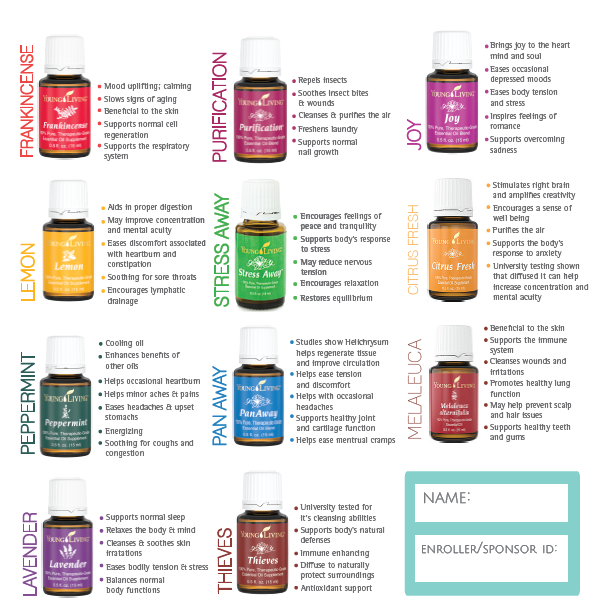 Essential oils have made such an impact in our lives since I started using them in May 2014. I will be honest. My initial interest was simply to use the oils to make my house smell great using the diffuser. I was not real sure about the medicinal benefits of the oils and I never thought using oils would be a way I could save money and keep me from having to buy cleaners and other household products. Aside from diffusing the oils, the next thing I did with the oils after getting my kit was to use the lavender to work on getting my boys to sleep better at night. I certainly had no intention of being one of those weird people who cooked with oils or consumed them internally….. um, now I am one of those weird people. Oils have become a way of my every day life. We use them for so many things. Here are ten lemon oil uses. There are so many more ways to use this oil, but here are ten to get you started. Use a few drops on sticky surfaces and it works just like Goo Gone. Caked on grease or food in your pots and pans? Can’t get it clean. Drop a few drops of lemon on it and a little elbow grease, and it’s clean! Add a few drops to your glass of water. It cleans your water and adds amazing flavor. Carry it in your purse to add to your water at restaurants. Make sure to drink out of glass and not plastic when doing this. I love, love, love my water this way! Cook with it! 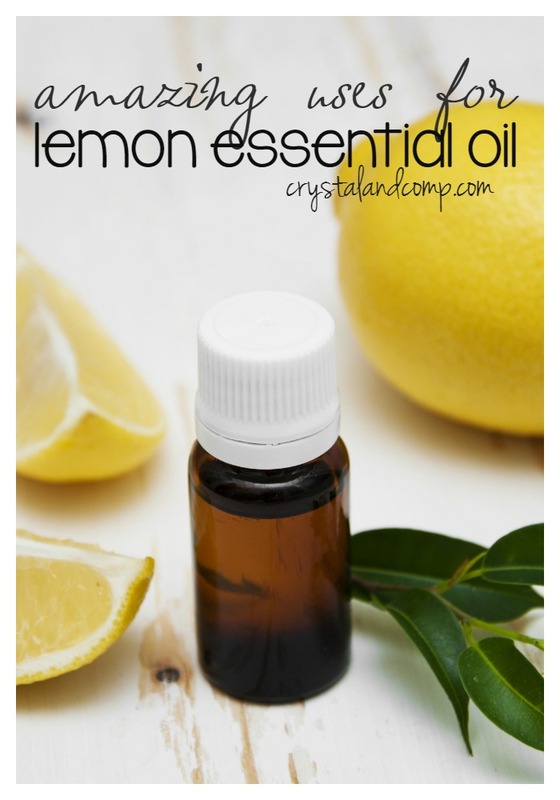 Yes, if a recipe asks for lemon juice you can use a few drops of essential oil instead! Yum! Use it to clean your fruits and veggies! Fill your sink with water and add 3-5 drops of lemon oil. Add the fruits and veggies and let them soak a bit. Rinse them to remove dirt and gunk, dry them and then pop them in the fridge. Clean the microwave with it. Follow the instructions in this post, but use a mug of vinegar and 2 drops of lemon oil. Make homemade natural cleaner. 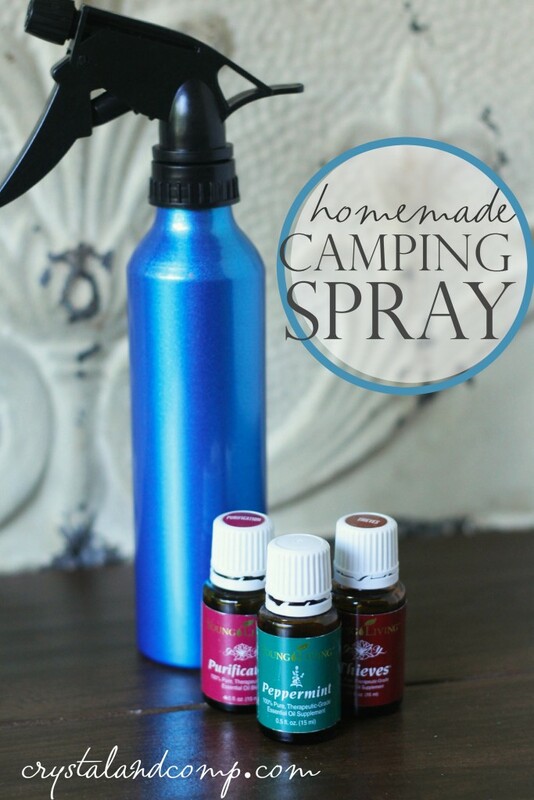 Fill a 16oz glass spray bottle with water and add 5-8 drops of lemon essential oil. 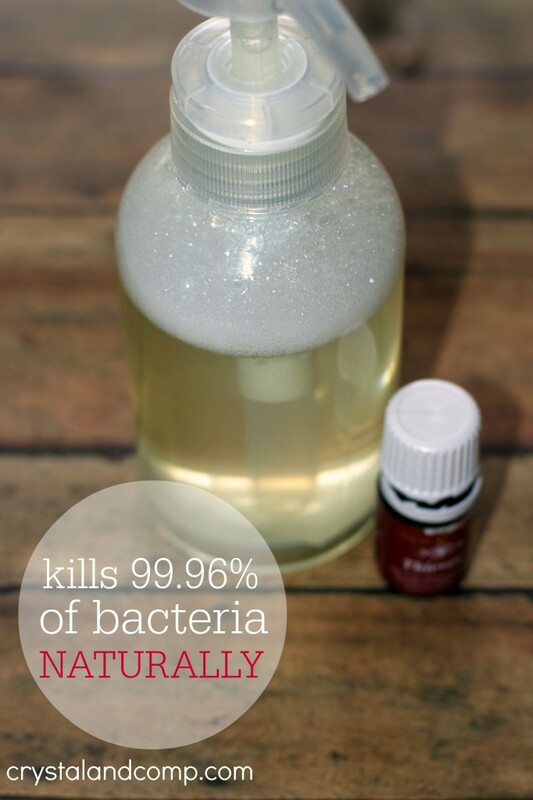 This is an all natural everyday household cleaner. Clean your stainless steal appliances using lemon oil. They will shine! 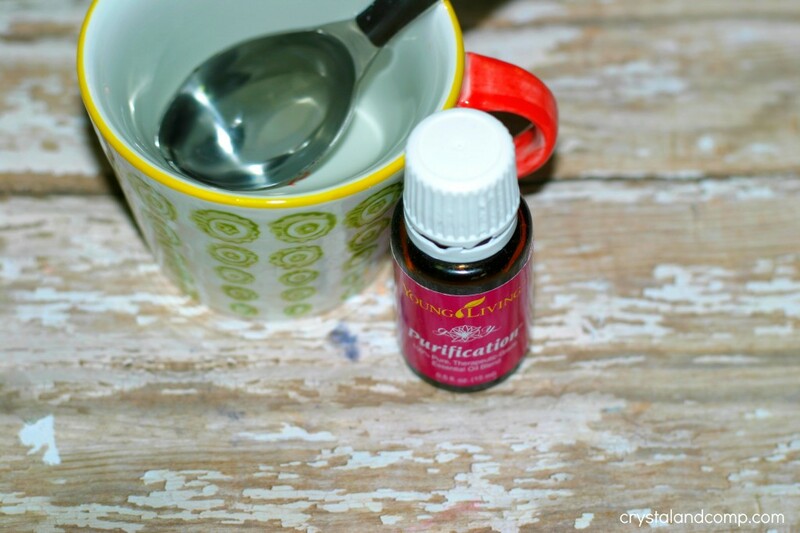 Relieve a sore throat by taking a coffee mug of warm water with 2-3 drops of lemon and a tablespoon of honey. Two things to remember are you always want to put citrus oils like lemon in glass when making cleaners or adding it to your drink. You also want to limit using lemon on any part of your skin that will be exposed to the sun. Citrus oils, like lemon, make your skin sensitive to UV rays. What is your favorite way to use lemon essential oil? I love that Young Living Oils are all therapeutic grade and they own all of their farms. They follow the process from seed to seal. There are never any synthetics are perfumes in their oils- ever. This oil does come in your premium essential oil starter kit which also allows you to purchase oils at a wholesale price. You can read more about it here. 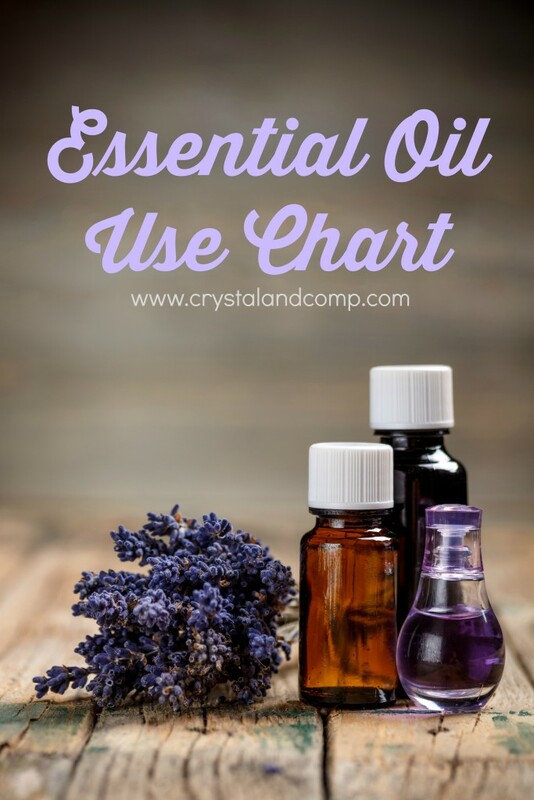 Here are more awesome ways to use essential oils in your home and more educational information so that you know the amazing goodness of oils. 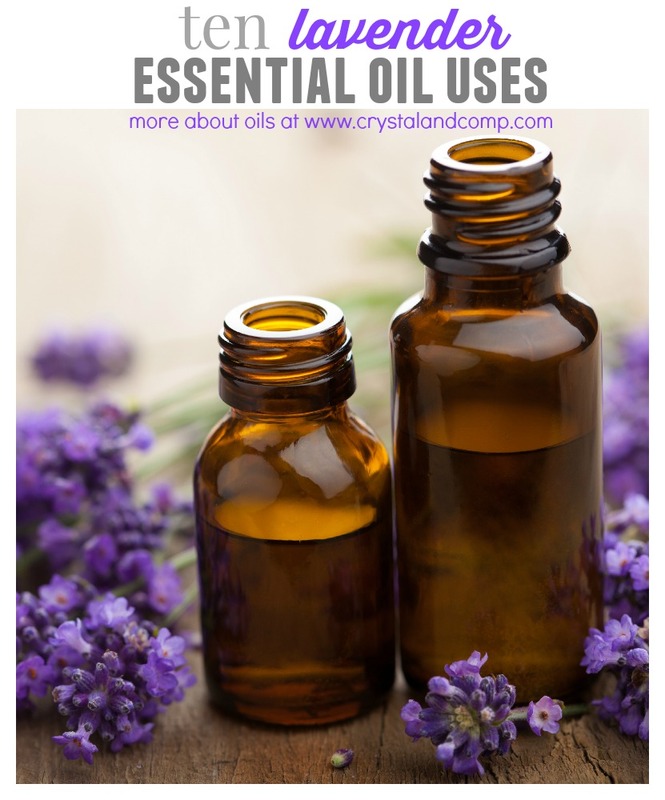 There were a few things that intrigued me about essential oils before I started using them. My kids have horrible sleeping issues- they pretty much always have. My husband suffers from insomnia and my kids do too at some level. Every last one of them are night owls. This is all hereditary, I believe. My mother-in-law has sleeping issues as well. Me? When my head hits the pillow I am out. I have always been this way. I knew that lavender was one of the most versatile essential oils on the market. I knew it could help me get my kids into a better sleeping routine. 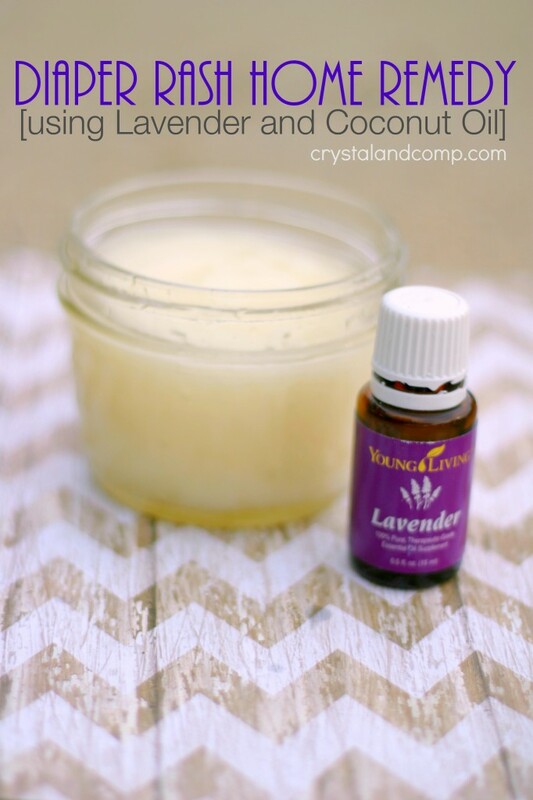 Here are 10 of my favorite lavender oil uses. Obviously, the list goes on and on. Can’t Sleep– add a few drops to the bottoms of feet and/or diffuse it and you are sure to sleep well. I have been adding it to my kids’ feet and we’re seeing sleeping improvements. It is such a calming oil. Sneezing and Stuffy– rub some lavender on the soles of your feet. 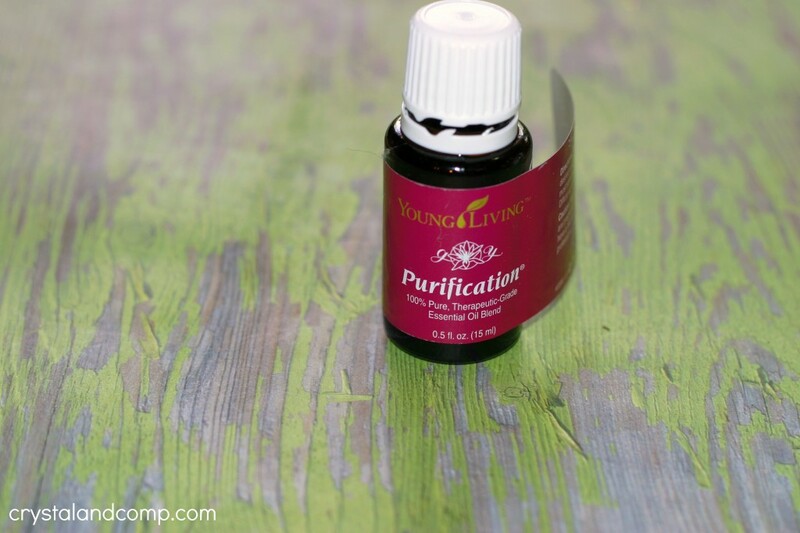 You can also diffuse it or digest it to help with allergies and asthma. Put 1-2 drops of lavender oil in the palm of your hand and rub your hands together. Then rub your hands on your face, neck and any part of our body that is not covered by clothing. You can also put 2-4 drops in a 00 capsule up to two times a day. 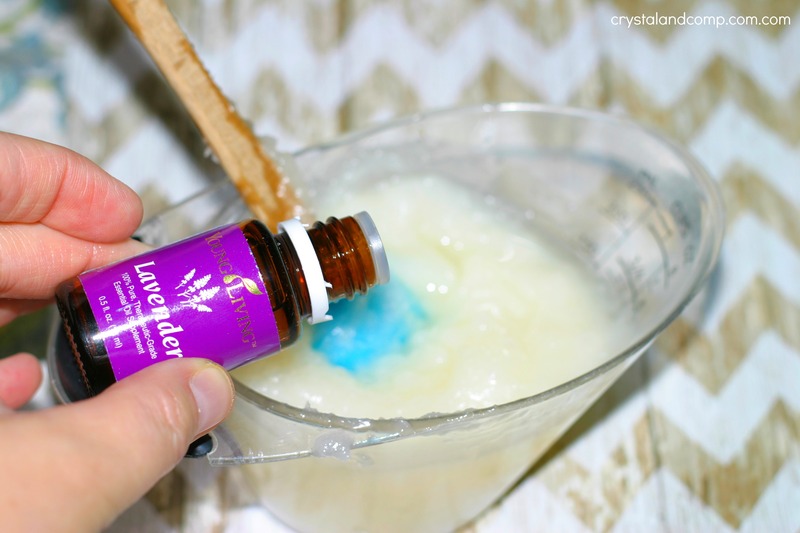 Fabric Softener– add a few drops to a wet rag and pop it in the dryer with your clothes. 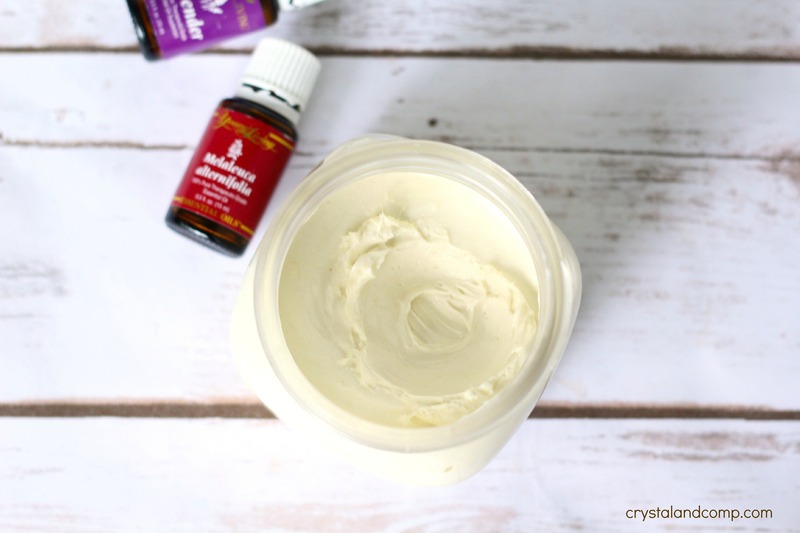 Diaper Rash– here is a homemade diaper rash cream I made! Two ingredients. Linen Spray– add 20 drops of lavender oil to 4 oz of purified water and spray on your sheets. I am making some of this! Relaxing– stressful day? Diffuse lavender. It smells so good and is very relaxing and calming. Here is one of my favorite diffusers. Cuts– you can put a drop of lavender right on a cut and it will disinfect and clean. 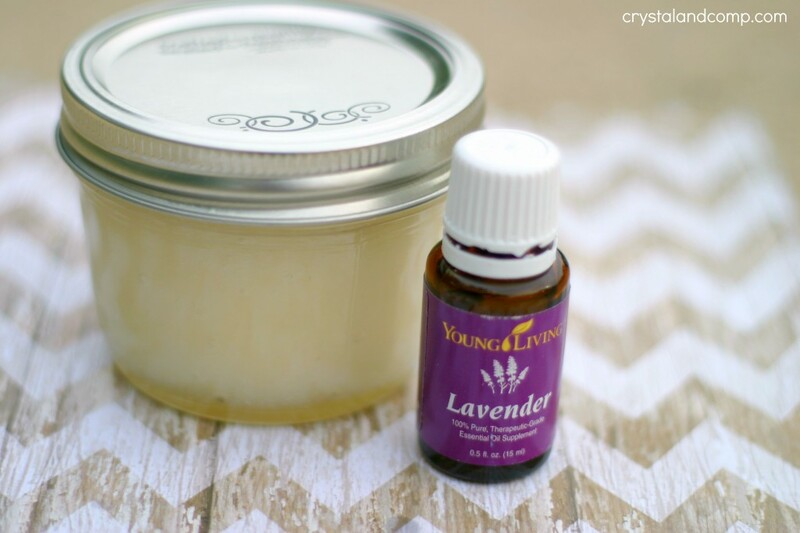 Bug Bites– place lavender oil directly on a bug bite or sting (hello, mosquito bites) and it will take down the swelling. 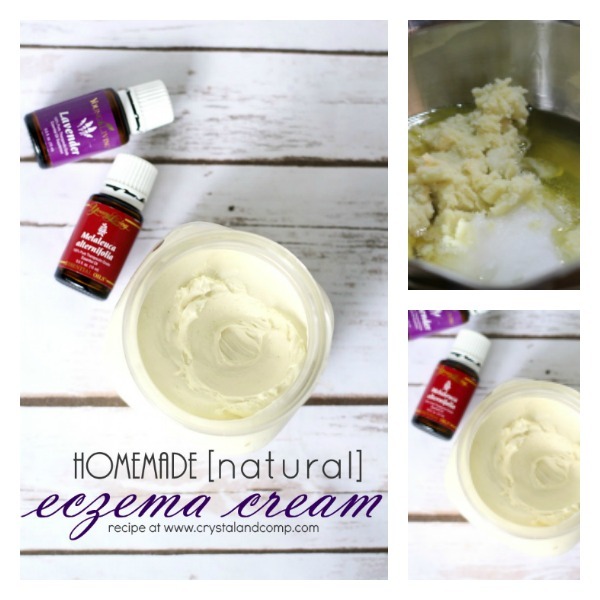 Super Dry Skin– here is my homemade eczema cream that I use on my youngest boy. Here is where you can buy essential oils online. I get all of mine from Young Living. I have been using essential oils for a month in our home and it is changing my life. I am on my way to making a chemical free home and cleaning out our medicine cabinets. 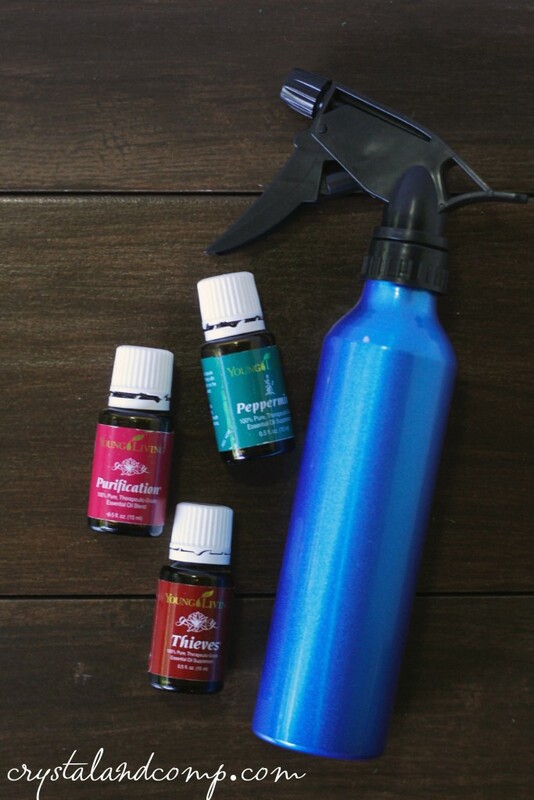 One oil that is allowing me to do this is peppermint. What I love about the therapeutic grade essential oil that use, is the fact that they are 100% natural and from a plant. There are no perfumes or synthetics in the oils I use. They can be consumed, diffused and used topically. The kind I buy never expire either! 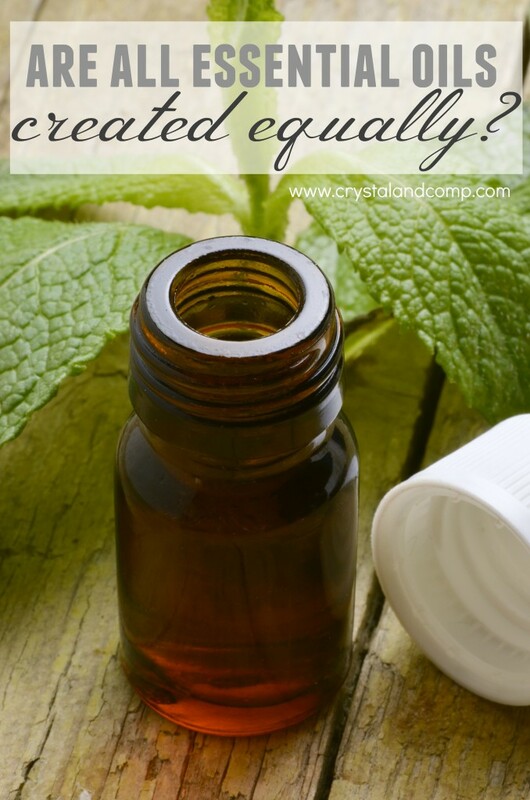 Here are 10 peppermint oil uses that I am doing in my home. 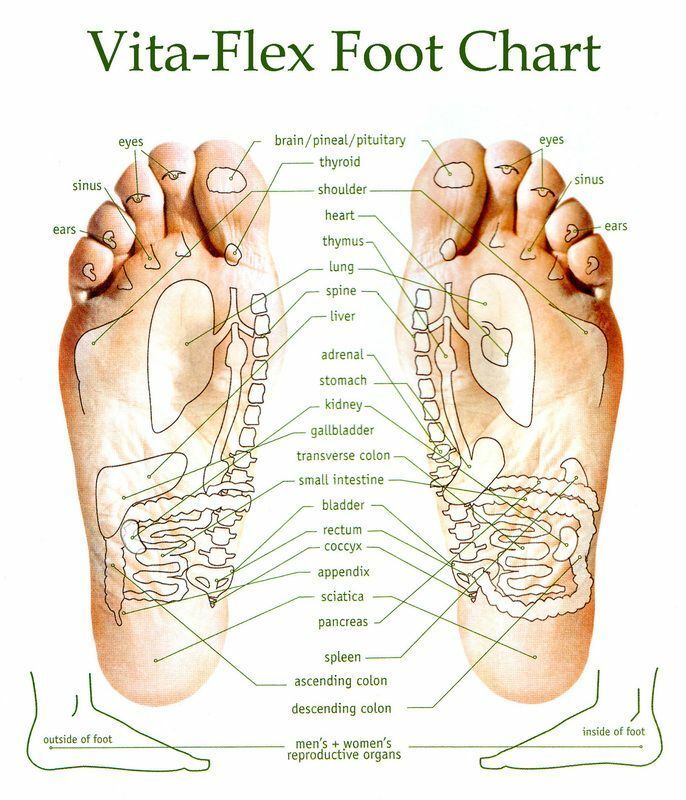 Cooling– rub a few drops on the bottom of your feet to help cool the body and regulate body temperature. Hiccups– here is a natural remedy for something that happens to us all! Apply a drop of peppermint on each side of the fifth cervical vertebra. This is up three notches from the large vertebra at the base of the neck. Bruising– apply peppermint immediately to a bruised area (that is not an open sore) to lessen bruising and the pain. Headache– to relieve headache put a drop of peppermint on the temples, the base of the neck, over the sinus areas and on the forehead. You can also put a drop on your thumbs and press it on the roof of your mouth to relieve a headache. Bug Repellent– make a homemade spray to keep mosquito at bay using peppermint and purification with water in a spray bottle. Also, ants hate peppermint. 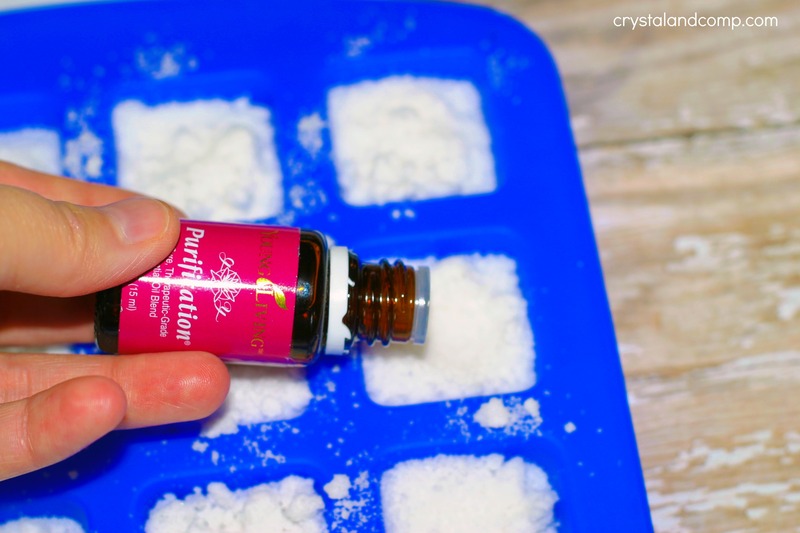 If you have ants in your house (like around the sinks in the summer time) use a couple of drops of peppermint in a spray bottle with water and a pinch of Epson salt. Ants hate peppermint. Natural Flavoring– add it to your water, cook with it (add a few drops your your cookies or brownies when you’re mixing them up) or add a few drops to your coffee or tea. Nausea– rub a couple of drops of peppermint on your abdomen to relieve nausea. Indigestion, Gas and Heartburn– rub 4-6 drops of oil in the palm of your hand and then rub it over your stomach and around your belly button. My husband does this one all the time! 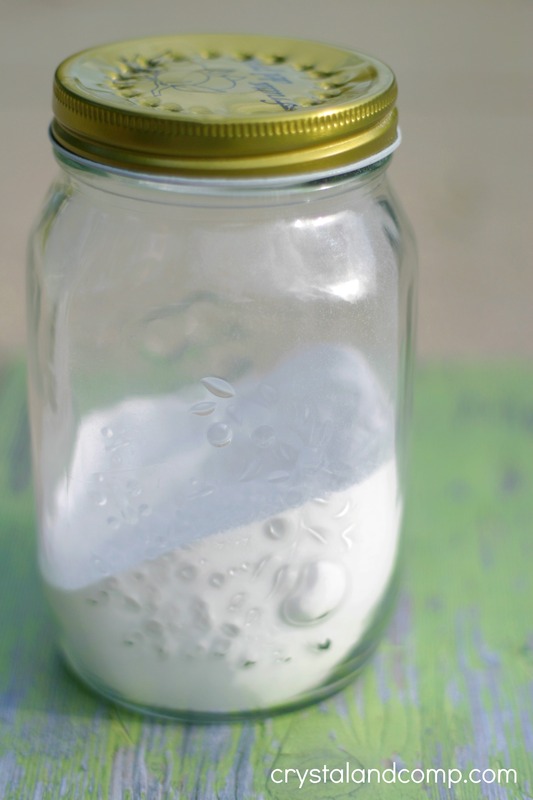 Paint Fumes– add a 15 ml bottle of peppermint to a 5 gallon bucket of paint and the fumes will be gone. Concentration– having issues staying alert at home or school (or while doing homeschool)? Place two drops of peppermint on the tongue and one drop under the nose to improve alertness and concentration. 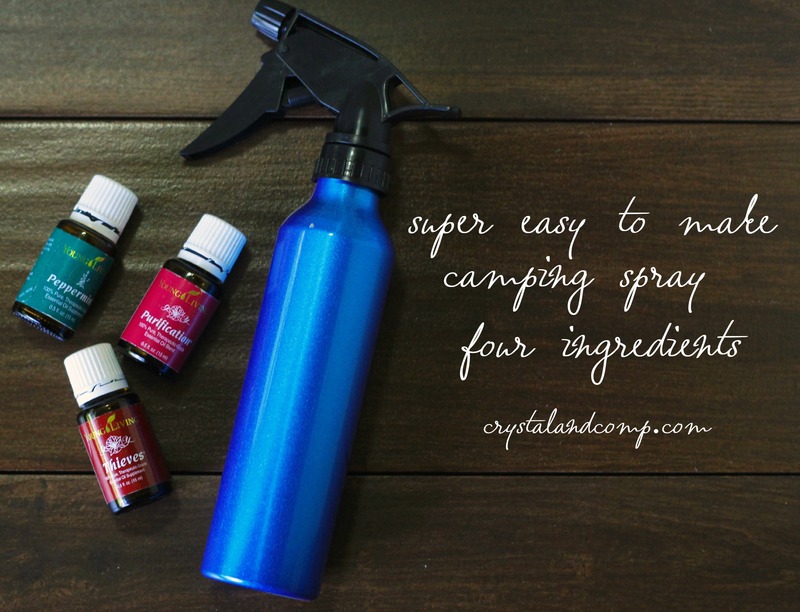 You can go here to buy essential oils online and use them in your home every day too! 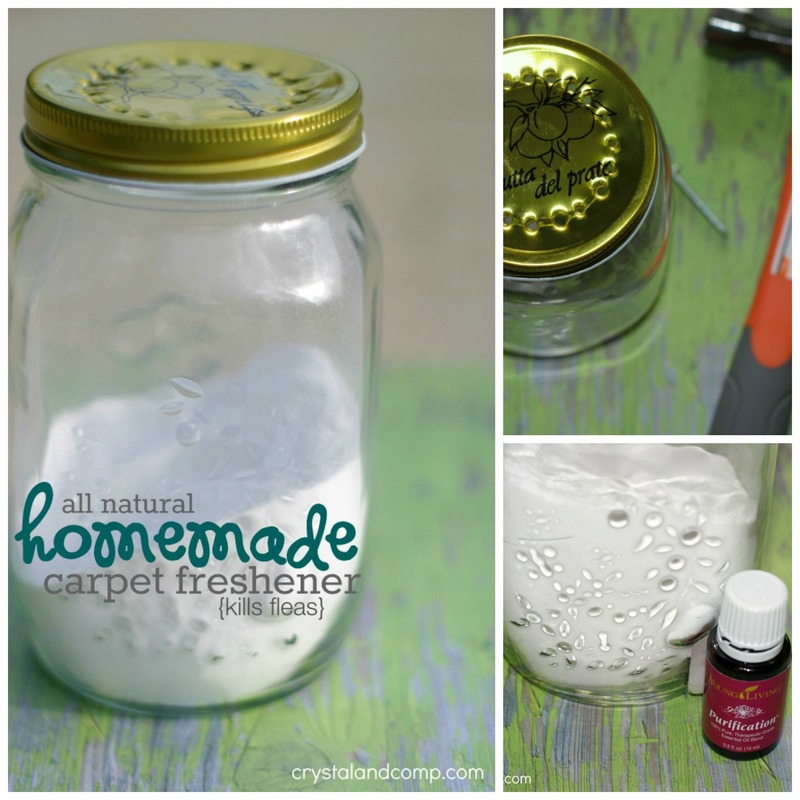 These are the ways we are incorporating oils into our home. I also love to put a few drops of peppermint in the diffuser. Mix it with a few drops of orange and it is really yummy! 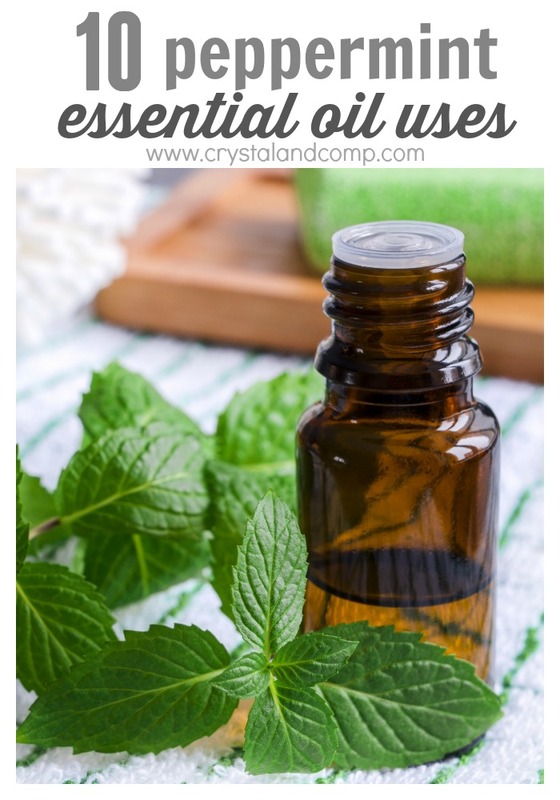 You can use peppermint essential oil in any of these homemade tutorials.